Bar chairs are meant to be designed and shaped according to the place where they would be used. So these bar chairs are supposed to be pretty high and tall and just simple in the upper seat design. A bar reminds me a number of drinks that are served there, whether it be wine, vodka, tequila, carbonated drinks or some other energy drinks. We have already upcycled a number of bar tables that practically being used in our homes and even in our business premises. So today we planned to recycle some repurposed pallet bar chairs. 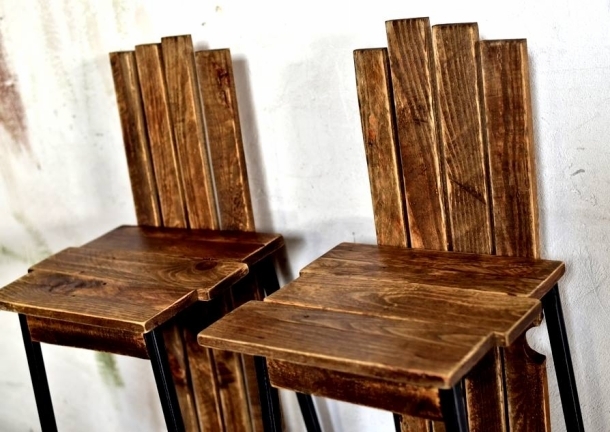 This certainly would be a great and encouraging idea for the ones who recycled pallet bars but were waiting for the pallet bar chairs. These pallet recycled furniture items are meant to give you all the facilities that you expect from some market based furniture items. At the same time they give you huge relief in the matter of finances. I think that is the most interesting part that you have all what you assent to, and still your finances are not embarrassed or drained, that’s the real beauty of recycling the wooden pallets. 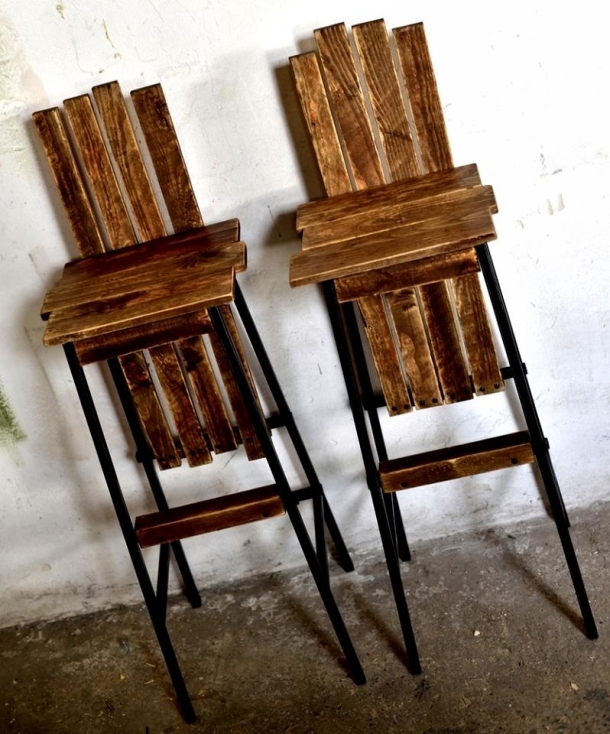 So these pallet bar chairs are also going to be a surprising inspiration for all the pallet lovers. 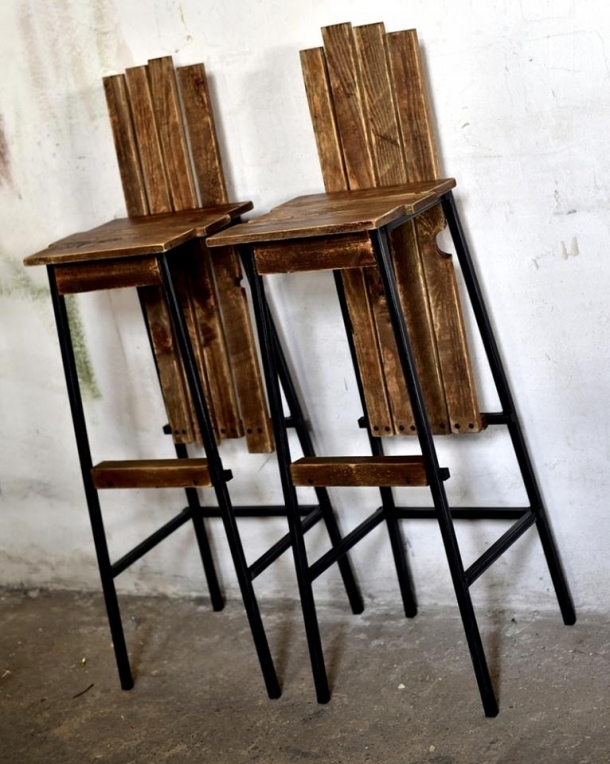 As we mentioned earlier that bar chairs are supposed to be tall, so some tall lengths of iron pipes are used as reclaimed or repurposed legs of these pallet bar chairs. There is a wooden foot rest in the middle, while the seat is also recycled with the pallet planks. The back is strong enough to carry all the weights. 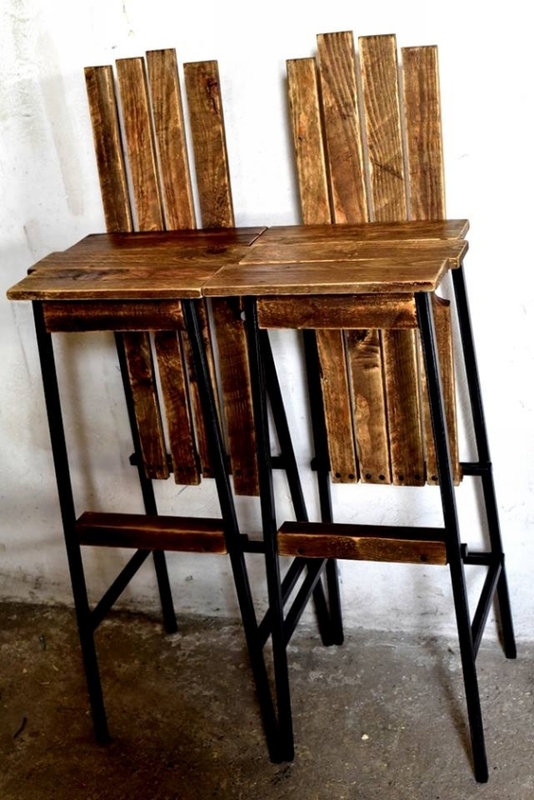 Place these pallet bar chairs in front of your pallet bar table and enjoy the whole atmosphere right at your home or for your business place even if you run a professional bar.